March Madness and IT Security have more in common than you might think. March Madness is in full swing, which means a lot of us have basketball on the brain. The NCAA playoffs make for a lot of lively discussions around the office, but more than that, maybe we can learn a few things from it too. 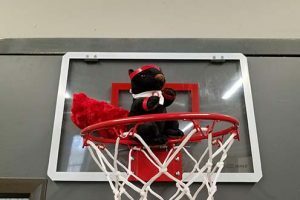 Have you ever considered that your IT Security is kind of like a basketball game? If not, they have more in common than you might think. For example, just like in b-ball, you need a good defense. And, your opponent, in this case, hackers, are persistently trying to get around you to score confidential information. 3 Basketball strategies to help complete your IT security playbook. 1. A good defense starts with the foundation. You need a plan to ensure you win. Are you going to run a man-to-man or a zone defense? What contingencies do you have in place should your opponent break through? In IT you need to know which firewall is best for your business and what software you should have in place to catch any spam that slips past it. Discuss your choices with your coach (a Managed IT Services Provider, like QualityIP) and optimize your technology to make it the strongest defense it can be. 2. Practice makes perfect. Let’s face it; humans are not faultless. In fact, 95% of all security breaches occur due to human error. Just like reviewing the highlight film, the best ways to improve your overall security are training and education. QualityIP offers a robust Security Awareness Training (SAT) program designed to train your staff on the common ways hackers attempt to gain access to your network. Weekly micro training keeps security awareness top of mind and gives your team plenty of practice recognizing the fake emails and scams that put your business at risk. 3. Both basketball and IT require physical protection. Your goal is to keep the opponent out of “the paint,” the area on the court where they’re most likely to score. Whether it’s locking up the office at the end of business hours or installing security cameras, you also need to protect your business where it’s most vulnerable. After all, you can take every security step in the world, but it’s useless if the data is physically removed and stolen. Make security the MVP of your IT Infrastructure today by giving us a call at 833-KNOWS-IT (833-566-9748) or shooting us a message! We’re happy to answer all of your IT security questions. And enjoy March Madness. We hope your team wins on and off the court! Written by Aly Woolmaker, Marketing Coordinator at QualityIP.